For some of my readers, my custom domain is not opening. I can see it is going in an infinite loop in the browser - and after a long time, it's throwing errors. My domain is setup, properly. Why do I have to deal with this? And we will investigate - and in many cases, we find the domain is setup properly. Some custom domain published blogs have problems, which have nothing to do with the domain setup. Some custom domain problems involve custom code, added to the template, long ago. Not everybody is in favour of the ongoing Blogger efforts to convince blog owners to force their readers to use HTTPS / SSL, in blog access. A number of hackers are making their websites popular, by providing code that lets blogs block forced HTTPS access - just as they provided code that blocked local country domain redirection. 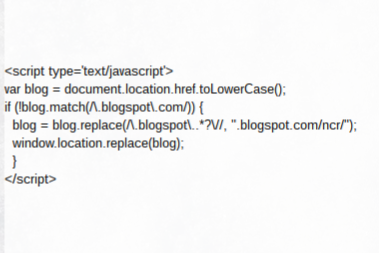 Some blog owners add this dodgy code, to their blogs. This hacking lets blog owners publish their blogs, and use accessories and gadgets that only support HTTP access. Unfortunately, with third party code, you get what you get. Some third party code, which blocks HTTPS blog access, works OK - for a while. When a blog is published to a custom domain, redirection to "blogspot.com" causes a redirect loop - or a security check. This is clever code, seen some time ago when used to block country local domain redirection. Then, as now, some blogs might be deleted or locked as malware hosts - or the blogs would become intermittently inaccessible. Is the unreliability appropriate? You can add what code you like, to your blog. Eventually, what you add may cause you problems. Some #Blogger blog owners add clever code, to block HTTPS Redirection, to their blogs. This is the same hacker provided code, used long ago to block local country domain redirection. Like country domain redirection, the code added may work fine, for a while. Eventually, the blog will be deleted / locked for malware hosting - or will start throwing 404 errors and similar confusion. Thanks, you helped me to fix my issue.